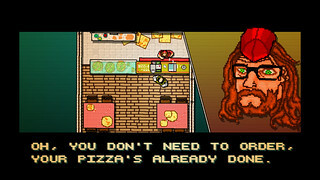 The teams at Dennaton Games and Devolver Digital are thrilled to announce that the pixilated brutality and neon hyper-violence of Hotline Miami will be testing the will of gamers on PlayStation 3 and PS Vita this spring. Through unknown black magic and dark arts, our friends at Abstraction Games are crafting an absolutely perfect version of Hotline Miami for both PlayStation 3 and PS Vita and are taking great care to take advantage of both systems nifty features. For those unfamiliar with Hotline Miami, it’s the debut commercial effort of prolific indie developer Jonatan Söderstrom and artist/designer Dennis Wedin. 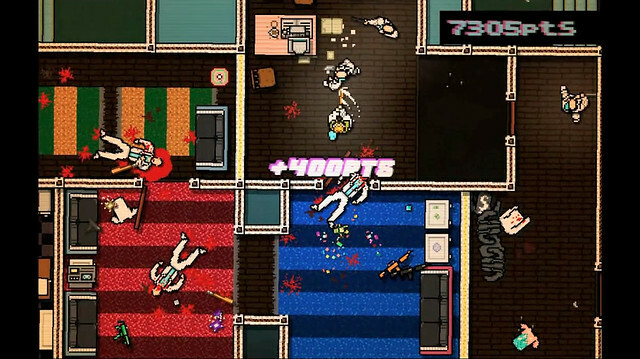 Hotline Miami almost immediately garnered praise from both gamers and press for its distinct visual presentation, driving soundtrack, breakneck action, and schizophrenic narrative that leaves players with more questions than answers. Since then the game has won awards from IGN, Destructoid, Machinima, and Indiecade culminating with a nomination for the Independent Games Festival’s Grand Prize. Stay tuned to @HotlineMiami on Twitter for sweet, sweet details as Hotline Miami makes takes aim at PlayStation 3 and PS Vita. PC version got good reviews, but I haven’t tried it since there’s no demo. Looking forward to seeing how it’ll play on a Vita though. Please consider a demo! Best game of 2012, hands down. Way too excited about this. So glad it’s coming, and, seemingly, so soon! great news. this makes strawberry face happy. Fantastic! Listen to the soundtrack all the time, and now I can actually experience it with the game! i’ll get it as long as its under $9.99 and Cross-buy. Great news! I really enjoyed the PC version (and I gave it a 10/10 on my blog newgameplus.co). I will happily re-purchase it to play on my Vita. Awesome News guys! Whoever is responsible for making this happen, keep it up the good work. We’re (Devolver Digital) working with Dennaton Games and Abstraction Games (handling the port) to make this happen. Can’t wait to share! i already own the game on Steam, but will gladly repurchase it a second times on ps vita, its just too well suited for it to ignore this awesome game. loll this looks fun, it reminds me of C-dogs which I have played a lot. Good move! Was really hoping this would happen. Very interesting. First I’m seeing of this game. Looks like GTA Vice City meets Retro City Rampage. I’d get it. 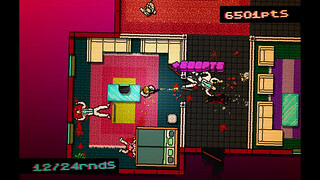 I’d “kill” for some Hotline Miami dynamic themes and avatars. Will Hotline Miami support Cross-Play and Cross-Buy? Finished this on PC, will absolutely buy it again for Vita! Great game. It’s interesting — to me, violence is hardly the draw of this game, but that’s the main thing that the description points to. As I see it, at its core, the game is just a twitch puzzle game… an EXCELLENT twitch puzzle game. I feel like the game play mechanics could have worked in any setting (violent or not). Bought this on Steam…bought it for friends as gifts, it goes without saying that I’ll pick it up again so I can have this gem everywhere I go. Now if only Sony supported a “GIFT” feature on the store, I’d be shilling this out like Christmas was every day of hte year. Seriously. Great game Fork. Hands down the best independent release I played last year, and I played plenty. I picked up the soundtrack during one of the bundle sales, but was saddened to see it didn’t include much of the Jasper Byrne tracks. That said, I know you have the full OST up through Soundcloud, but I would LOVE to see a GAME + SOUNDTRACK bundle on day one. Not the small sampler OST, the big 22 track pack would be awesome! What about controls?Its sometimes hard even with kb+mouse. I was really hoping for a console port of this; the Vita and the Cross-Buy are just icing. Will the OST be available as well? I played the PC version with a controller and I just kept thinking how well it would work on the Vita, so I’m very happy about this and more than willing to buy it a second time. HOLY COW WILL TRIPLE DIP WITH A PRICE OF DOUBLE DIP! one of the best gaming surprises of 2012! 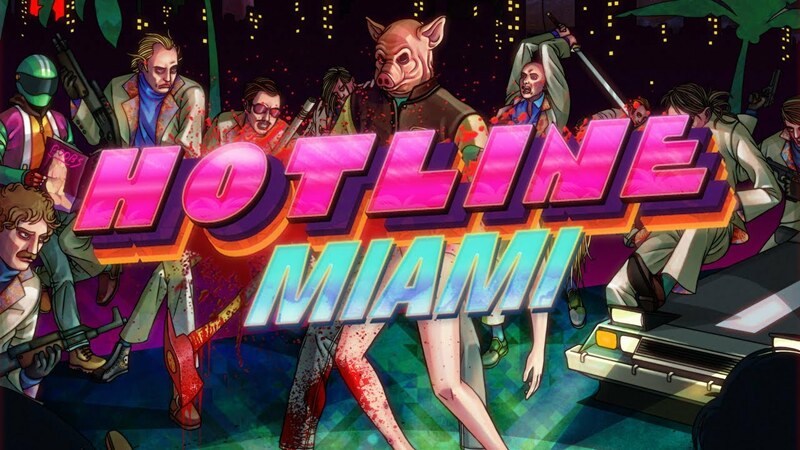 PS users will finally experience the brutality of Hotline Miami, YEAH! Hmm maybe. Need a demo. Will it have a platinum trophy? Thanks for the response. Can’t wait to finally play the game. Saw Yahtzee’s review for this game and was intrigued, but disappointed. Hate when he reviews PC only games. BUT, I guess I don’t have to be disappointed anymore come spring. See you guys then. Buy this game people. It’s amazing on PC. The soundtrack stands right up there with the best of them. I get pumped every time I play this game. The music is perfect, and the gameplay is a rush. Thank you for this! I already bought this on Steam, but I am definitely supporting you guys and getting it on PS3/Vita. My brothers and I absolutely love this game (all bought it on Steam already). I hope more people will give this a chance. It is truly one of the most unique/challenging/fun games I’ve played in a while. Yay, more Vita games, thanks! this… soundtrack!!! The game looks great but I’m sold just for the badass soundtrack! Is there a way I can just give you my money now? This is a common issue we face as a small publisher of absolutely magnificent games. While initial attempts by our fans to “throw money at the screen” frequently meet with failure we are working on technology to accept actual payments through this unorthodox method. Additionally, we have a team of scientists developing the ability for us to take payment from consumers without their knowledge or consent but are facing quite a few legal and ethical hurdles before this project can move into beta. For now we recommend following @DevolverDigital and @ForkParker on Twitter or becoming a fan of use on Facebook at /DevolverDigitalGames. If we find ways to take your money rest assured we will announce them there. Like $9.98? Right on $9.99 is more likely. Thanks for the love, can’t wait to get it in your hands! Really glad to see such a great game make the move to PS3 and Vita. Having this on a portable just seems so right. I have two questions towards trophies: will the game have a platinum trophy, and if we unlock a trophy on a system, will it be unlocked on the other? That’s something our friends at Abstraction are looking into. Will definitely let you know once that is all confirmed. Yey, one of my dreams come true. I really wanted to play this game on the handheld. Vita’s control inputs and quick suspend/resume function will enhance the game play greatly. Very excised for Hotline Miami coming to not only PS Vita (which is an absolute great PlayStation handheld) but PS3 as well, just awesome! Gives those that have one or both systems to enjoy this. Thanks and can’t wait… but willing to, lol! H O L Y C R A P! I had been checking the Hotline Miami website frequently for months looking to get information on whether this game would even come to Vita so this is the best news I could get! Thank you so much for the port and I look forward to spilling some blood. never hurd of this but looks like my style. Already picked this up on Steam, but I will gladly throw down another 10 bucks to play it on the PS3/Vita. I hope there’s a demo, because this one of those games you have to play yourself to really appreciate. damn, so excited, cant freaking wait ! It’s funny as I heard a lot about this game during the different 2012 awards and almost bought it. I’m not much of a PC gamer though and soon I can get this for $9.99 on my PS3 and Vita… Other company’s should look at how well this sells at this price and learn from it. Great news guy’s. The game looks like fun. I was a huge fan of the game (won it through a Dtoid contest), so I’d be more than happy to buy this version to help support you guys (As well as enjoy the game once again on my gorgeous vita). Any new content such as masks or weapons? or is it just a straight port? And in terms of controls, will it be the same as gamepad support on PC? or will it be different?